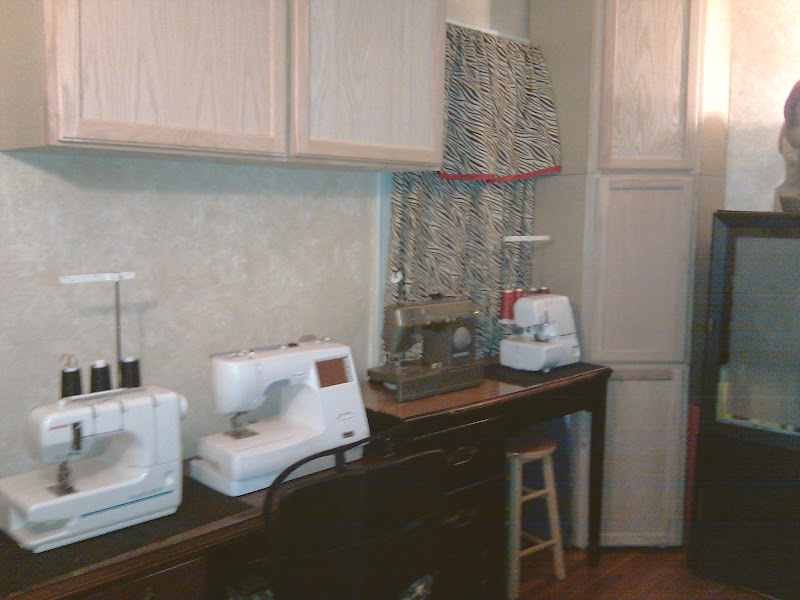 ETA: Thank you for the Awesome Compliments on my Sewing Room makeover. Melodye asked if I use my sewing machines where I have them now? Yes I do, if more space is needed I just move a machine over. She also asked for a pic of how I stored my threads. I used mini plastic bins, which makes it easier to pull them down and retrieve the thread I need. This past weekend was eventful, over the last two weeks my guy and I discussed my sewing room. 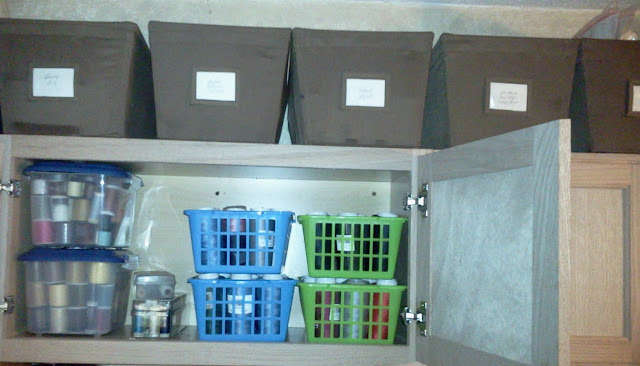 Mainly he kept mentioning that the room was crowded and I was wasting space with the hodge podge of plastic containers and shelving lining nearly every wall space. At first I was against it, but gave in and we discussed what would work best for the room. I'd mentioned to him the inspirational post at My Yellow Farmhouse... I swooned after reading it. He immediately stated he would make the cabinets, but I was against it, it would take too much time. Then we decided assembled cabinets would work, took the measurements and last week ventured over to home depot. Luckily there was a 20% off sale going on for all in stock cabinets and we settled on the unfinished cabinets mainly because they were the cheapest and blended in perfectly. Honestly, I didn't anticipate him starting the makeover so quickly. Saturday, I was working on a top (pictured below) and he came in and immediately started pulling stuff out of the room... umm yeah ... like 8:00am. So what is a girl to do.... fall in line.... together, my guy, brother, daughter and I removed the boxes, shelving, containers full of fabric, etc. had to take the door off the sewing room to move out the cutting table, dollie to move the audio peers that housed books, etc. There was a lot of commotion going on, but once the items that needed to be moved out were moved... the guys went full throttle putting the cabinets in, that by Sunday... most of the cabinets were up. I was persistent about keeping at least two containers in the room (which are housed under the cutting table) which is the to-sew-up-soon- fabric. Actually last nite he mentioned again, that we should consider replacing the cutting table with 2 floor counter cabinets which would be higher and prevent some of the back pain I've been experiencing. Also the cabinet will allow me to store fabric instead of using the containers, and he would make a customized table top for it. So we have a few more trips to make to home depot. 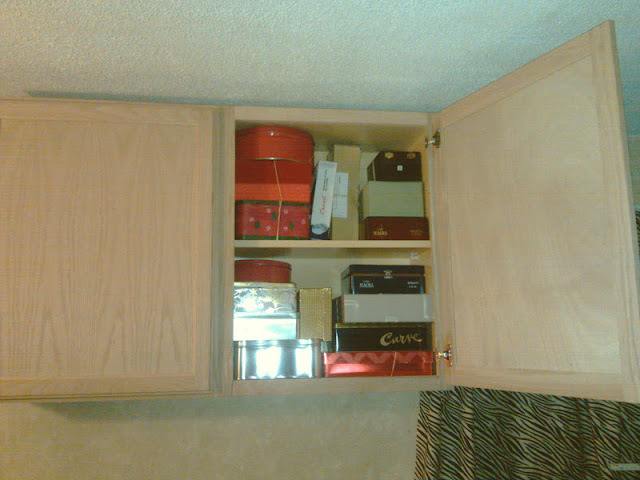 Peek at what the cabinets contain... boxes that houses sewing/crafting paraphernalia. Finally, all my patterns are housed in one place for now. He's trying to convince me to replace these cabinets, but I am not ready to give them up and for now they will remain. Very nice. I'm actually jealous. I'm just envious that you have a sewing room! Very thoughtful man you have there; plus, with all the help, I'm sure it wasn't as painful as making over a whole room would normally be. Great job. You know you have the smoothest voice! :) And I love, love, love your new room! Now I'm gonna have to mosey on over to Home Depot and see if I can find some stock white cabinets and shelves to finish my sewing room off! Enjoy creating and crafting in your new room! Awesome! I sew in my bedroom; it's nice to see your space. Wow Sheila. Your room looks fantastic. The cabinets are a great idea! Is that a NY accent that I detect? My boss is from NY and I am always trying to sound like him. I may have to share this post with my husband! Very inspirational! What a great guy. I think your new room looks fabulous. You have SUCH a good man, Sheila! I can't imagine my husband doing all that work - when I bought my tall cutting table and sewing cabinet, I put them together mySELF! I was proud of it though. Your room looks awesome - thanks for the video. GodsgirlT: I am southerner by birth and a New Yorker by day...lol and glad you are inspired... go for it. Sister: Thank You... Dear Harold/DH/My guy is a total gem... He has such a kind heart and makes our lives so easy/comfortable. Your guy and your brother are a gem. Can u send them over here. Please listen to your guy, let him re-do the room, sounds like he has some great ideas. It's so funny how when our DH's get an idea they run with it. 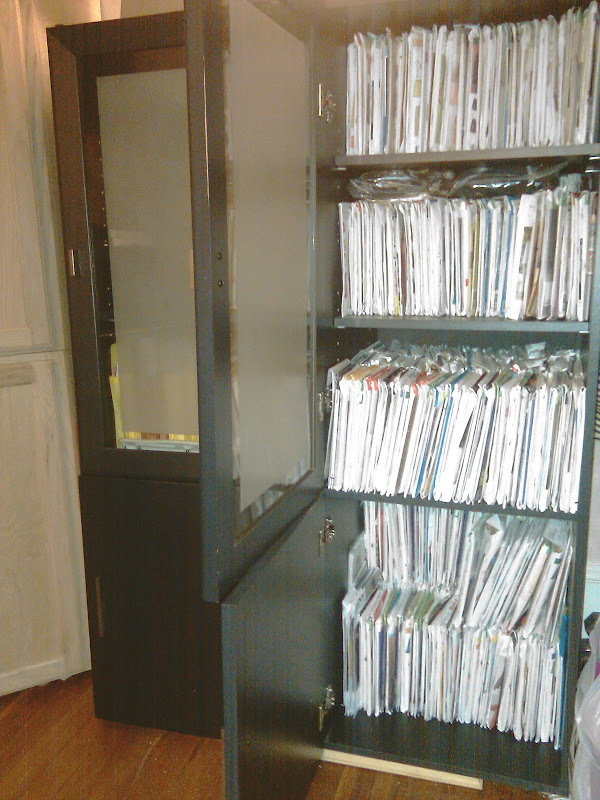 My husband had just as much fun as I did building my new "Sewing Center", but after I started moving my things in he declared that I had "junked" it all up again. I love your new cabinets! Enjoy! You have a very nice set up there! Thanks for sharing! 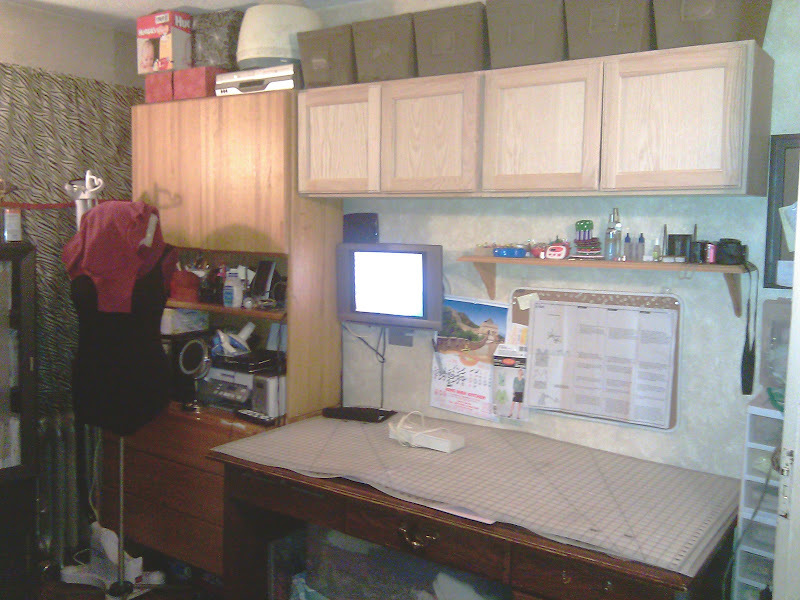 I am looking into a makeover of my messy & neglected sewing & makeup room! After the pregnancy then works will begin I guess! Great job on your sewing room! My husband offered to build shelves in my craft room but that's as far as it got. I have to show him your sewing room to inspire him! Your man is very special. He's done a good job getting your space to work for you. More lighting is always an excellent idea and pre-made cabinets was clever to reduce the 'reno' time. Thank you for the virtual visit. Lucky girl!! Enjoy your "new" space. Sheila, what a wonderful room! And a fantastic DH. If his name is Harold I think being wonderful goes with the name as I have a Harold too! A couple of questions though. Do you use your machines on the table where you have them or do you move them? And would you put up a pic of the inside of the thread cabinet? I'm looking for ideas for thread storage. I have the embroidery thread in a cabinet next to the embroidery machine, but sewing thread is still a mess. Thanks!! I agree with Carolyn: you have a lovely voice! Does your guy have a brother ...? Thanks Alethia: You are so right. Thanks Mary Sews: Great idea for the cutting table. Sheila, this is a wonderful room, your guy did an amazing job! Shiela, thanks!! Gives me something to think about. I agree with Alethia it seems like his has some great ideas on how to make it more functional for you. Love the room! are you going to paint the cabinets? I'm green with envy! I absolutely love your new room. Gotta love the Man!! Carla, the unfinished cabinets blend nicely with the wall paint and will leave them unpainted. Adrienne, I thought about organizing them, but know I wouldn't maintain that order. Sheila Baby there you go showing off again, LOL Let Mr. Man work his magic and stay out the way :) He knows BEST...Hollar!!! I'm jealous, but so happy for you. It's a beautiful space! Wow, wow & more wow! Nice job Mr. "Bob The Builder!". I bet it's a great feeling of inspiration for you to be in this beautiful creative room! Love the accent! I had no idea your voice would sound like that. You could do radio. It sounds like someone who'd do a midnight jazz set. You're really lucky to have your guy. He's definitely a keeper. So few people these days possess the talent that you have and your guy. Your video was akin to looking in the medicine cabinet at someone's house. Only I got to be nosey with your permission:) . Syl... Just maybe if I could tame my sigmatism (a term I like better thank lisp), a radio personality sounds like a good career possibility.. Wink. Girl, you know I'm playing catch up. We talked about your new sewing studio, but it's nothing like seeing it. It's lovely. I can't wait to have one of my own. Thanks for the inspiration. You have such a great space to sew in. I'm currently using my dining room table. I tell my daughter all the time, once she moves out, I'm turning her room into a craft room! LOL!